← Go Ahead, Have a Bite! 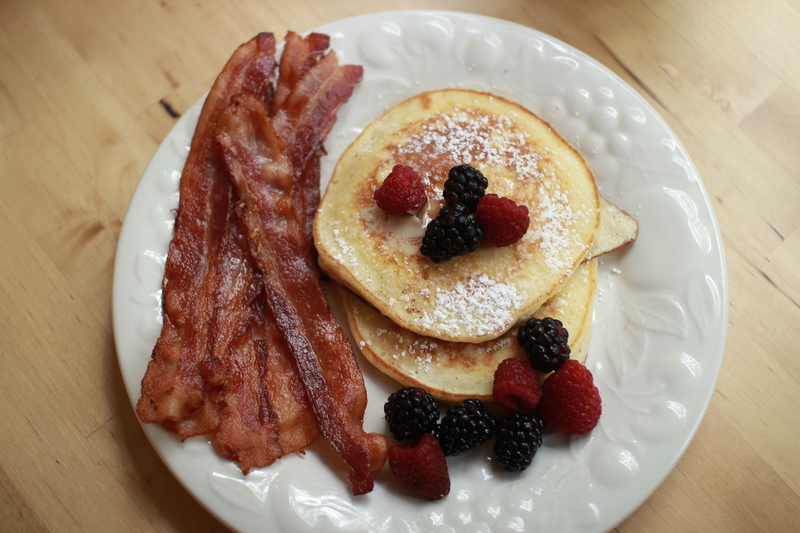 My lemon ricotta pancakes and bacon- a great way to show your man some love. Ever since I first heard about lemon ricotta pancakes, I’ve wanted to try them. They sound like the perfect Father’s Day breakfast. I especially wanted to make them because my daughter went to Claire’s on Cedros in Solana Beach, California, and told me she ate the best pancakes of her life there. How could stinking Claire make the best pancakes of her life when mine, her baker/cook mom’s, are supposed to be the best? 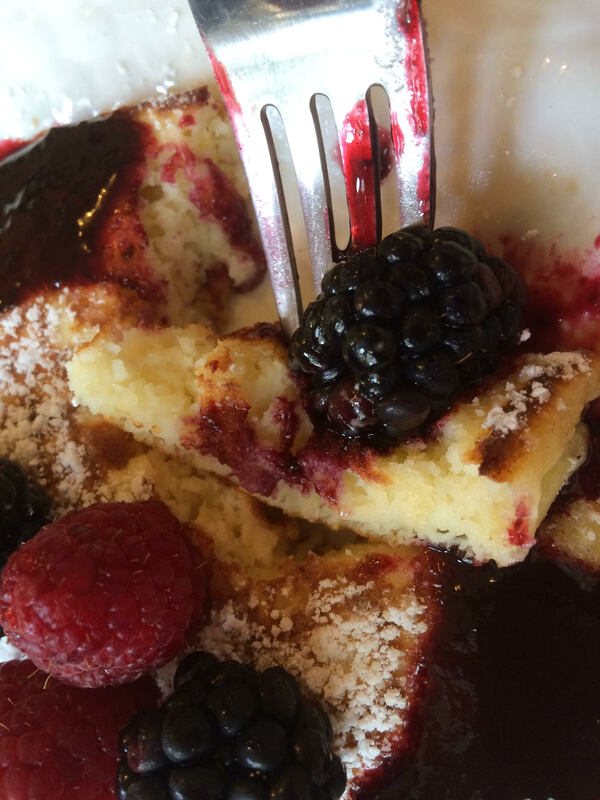 (The answer is easy, I’d never made lemon ricotta pancakes.) I wouldn’t rest until I found a great recipe and created pancakes that could at least compete, if not pummel Claire’s. I tweaked the WS recipe by cooking the pancakes in butter and by adding two drops of lemon oil, but changed nothing else. The key to these is the whipped egg whites, which made them nice and fluffy. Dear God, these were good. My daughter, whose palate is far too sophisticated for a 19-year-old, thought they might be a skinch too lemony, but she liked them. Just leave out the oil and they’ll be less lemony, but just as good. (I never got out of her whether they were better than Claire’s or not.) Guess I’ll have to go there and see for myself. They’re really good with a berry compote, I used blackberry. These pancakes are a combination of my dad’s two favorite things, pancakes and lemon, and he would have loved them on Father’s Day, or any day. In his honor, I wolfed mine down just like he would have. It was a tiny tribute to a man who was everything a father should be, and much more. And If you’re making the pancakes, definitely serve bacon. But do it the easy and tasty way. 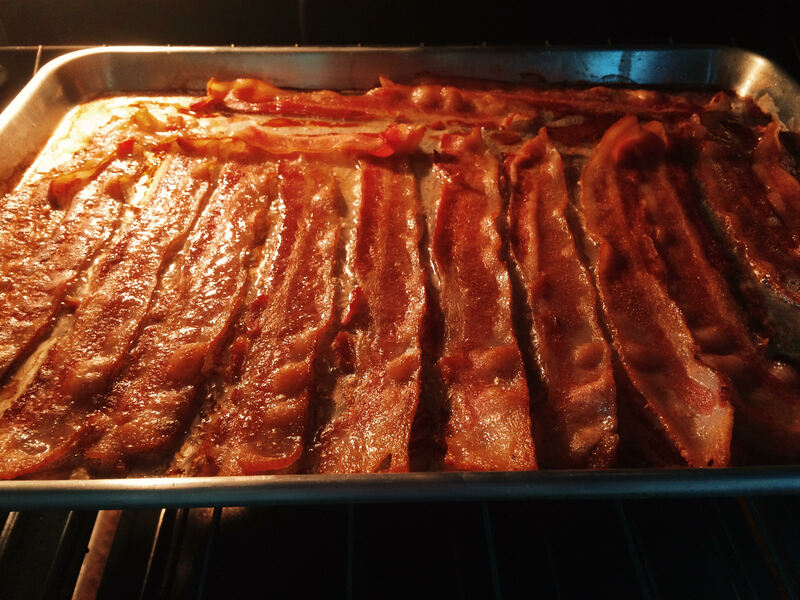 Lay it out on a cookie sheet, sprinkle it lightly with brown sugar and bake it at 375 until it’s done – about 20 minutes to a half hour. You will see God when you taste it. Trust me on this. I’m sending along a link to the Williams Sonoma recipe, but will share it here too. Thanks to all the fathers, out there who do their best to be the finest dads they can be. Your kids are watching and learning from you every day. Happy Father’s Day! I hope you get pancakes. 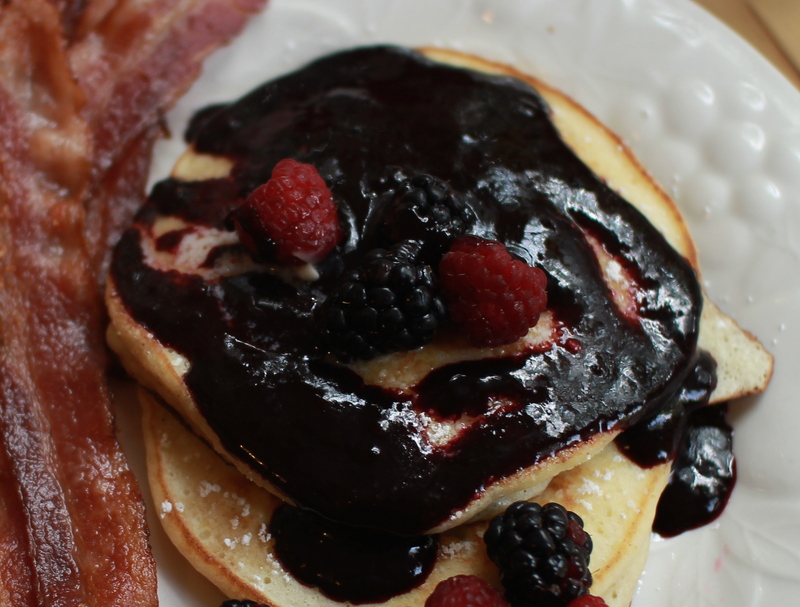 If you’re going to eat pancakes, then eat really good ones! In a large bowl, whisk together the ricotta, milk, egg yolks, sugar, lemon zest and juice until smooth. Sift together the flour, baking powder and 1/8 tsp. of the salt over the ricotta mixture and stir with a wooden spoon until just combined. 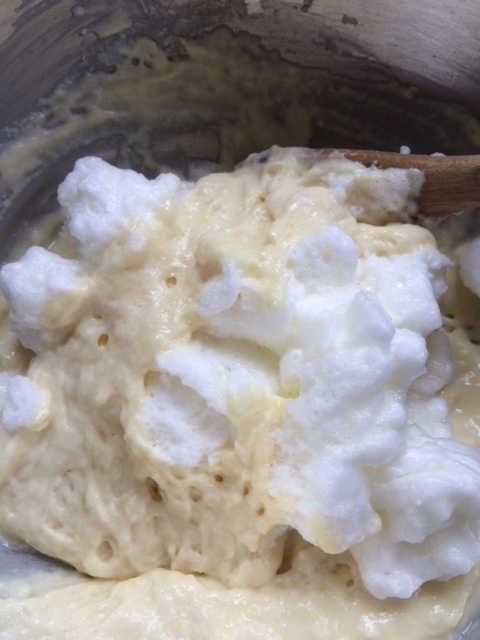 In another large bowl, using a whisk, beat the egg whites until frothy. Add the remaining 1/8 tsp. salt and continue beating until soft peaks form. Using a rubber spatula, fold one-third of the egg whites into the ricotta mixture, then gently fold in the remaining whites. Preheat a griddle over medium heat. Spray the griddle with nonstick cooking spray. (I used butter, but you have to be careful, because it will burn. Next time I’ll try peanut oil) Ladle 1/3 cup batter onto the griddle for each pancake. 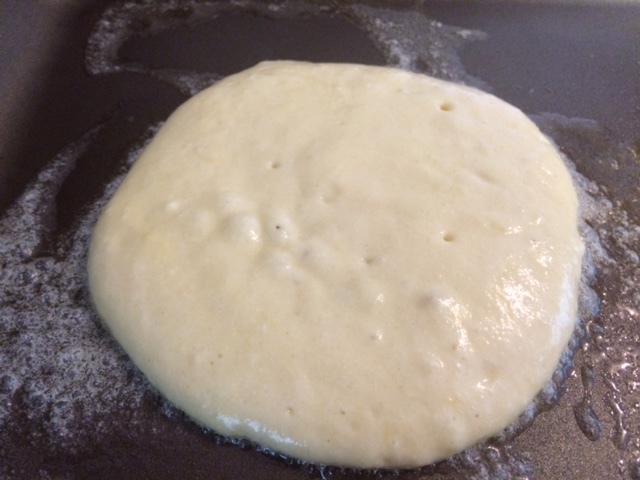 Cook until bubbles form on top and the pancakes are golden underneath, 1 to 2 minutes. Flip the pancakes and cook for 1 minute more. Transfer to a warmed plate. Repeat with the remaining batter. Makes 12 to 14 pancakes. The lemon and blackberry together are wonderful. 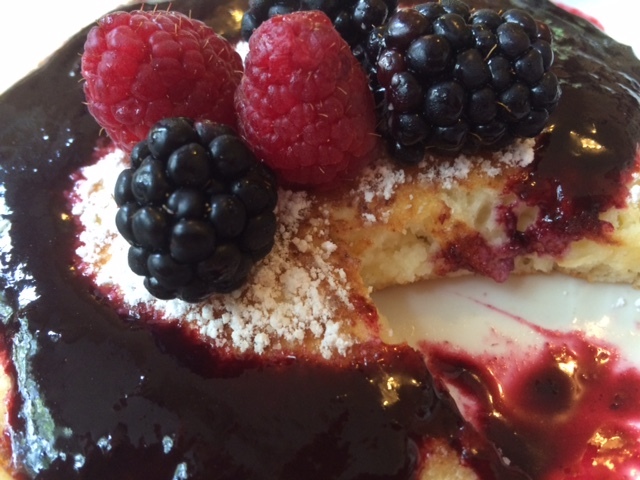 I sprinkled the pancakes with powdered sugar, put blackberries and raspberries on top and drizzled with blackberry compote. Place the berries in a strainer and crush them so the juice comes out. Discard seeds and pulp. Place juice in a small pan with sugar and stir about two minutes until sugar is dissolved. Add liqueur, if you want, and remove from heat. Pour over pancakes. This entry was posted in Great Breakfast and tagged amazing pancakes, bacon, bacon with brown sugar, blackberry compote, Claire's Lemon Ricotta Pancakes, Claire's on Cedros, delicious pancakes, fabulous breakfasts, Father's day recipe, humor, Lemon ricotta pancakes, Williams Sonoma lemon ricotta pancakes. Bookmark the permalink. I am laughing that you want to throw down with Claire’s. Seems to me that competitive spirit is what led to a cardboard Scottish castle with turrets and a drawbridge. I am sure Claire would probably wipe the floor with me, but I’d give it a go. And yes, that competitive spirit is definitely what got us in over our heads in castle hell! I loved every minute of it! Glad you were there to guide the project! Those look delicious! You’ve certainly put Claire in her place! Your kitchen is surely the E-Ticket! I just made them again this morning and succumbed to the temptation– again! They are worth it. Quite tasty. Must travel to Solana Beach and try Claire’s. I conjure up an image of Whimpy (that old cartoon character) when I think of eating all of your yummy dishes. I’m sure it’s what I’d look like if I cooked like you do, Fran. This one sounds great but I was never quite the lemon fan that Dad was. It’s okay, but I liked other things better. Looks scrumptious!! They’re really yummy. And, “I’ll gladly pay you Tuesday for a hamburger today.” Thanks for reading! Yuuuum… can you just come to my house and make them please Fran???? I feel too fat and lazy after reading that delicious recipe in this heat, to even think about making them. I think they’re the most delicious things I’ve ever eaten – next to your biscotti – and I haven’t even eaten the lemon ricotta pancakes yet!!! I’m just thinking about eating them – hmm hmm sooo good! I would happily cook anything you want me to…in fact, I will be baking tonight, just for you! We will have to take a drive to Solana Beach for some scientific testing one day soon, don’t you think? I mean, sacrifices must be made for science. Hi Fran! Congrats on having them turn out so well. Mine burnt. I had these once served with breakfast sausages. The sausages had an orange marmalade glaze and were perfect with the ricotta pancakes. Powdered sugar was sprinkled on top of the pancakes. I ate them just like that. They were very light and moist. I love the orange marmalade glaze with the sausages, great idea. I’ve never been a marmalade fan, but that sounds delicious! Yes, light and moist definitely describes them!